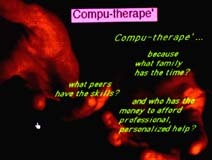 Compu-therape' was designed, prior to the debate raised by Clinton, as an ironic response to the health care system in the US. It is an interactive program running from a touch-screen console. Users are informed that this tool is a last hope for those without the means for proper care. The piece uses Rorschach theory to diagnose user response to inkblot imagery. A second irony lies in the manner in which the Compu-therape' test is administered. By forcing users to define their responses according to a constrained, impersonal category of choice, generally used in classification by machinic operations of society, the notion of projective testing is subverted. In actual tests, a trained psychoanalyst is extremely cautious not to influence the subject's interpretation in any way, and also analyzes many more subtleties in the response than I attempt in the artwork.